Warner Bros. Pictures and Village Roadshow have debuted a new TV spot for the upcoming Edge of Tomorrow which you can check out in the player below! Opening in 3D, 2D and IMAX 3D theaters on June 6, the sci-fi thriller stars Tom Cruise, Emily Blunt, Bill Paxton, Jeremy Piven, Ciaran Hinds, Noah Taylor, Kick Gurry, Dragomir Mrsic, Charlotte Riley, Jonas Armstrong, Franz Drameh, Masayoshi Haneda and Tony Way. 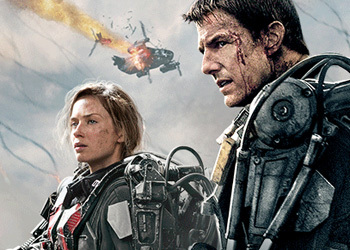 The movie is based on the acclaimed novel "All You Need is Kill" by Hiroshi Sakurazaka. The action unfolds in a near future in which an alien race has hit the Earth in an unrelenting assault, unbeatable by any military unit in the world. Lt. Col. Bill Cage (Cruise) is an officer who has never seen a day of combat when he is unceremoniously dropped into what amounts to a suicide mission. Killed within minutes, Cage now finds himself inexplicably thrown into a time loop—forcing him to live out the same brutal combat over and over, fighting and dying again…and again.